I think this is a new collection from Revlon...it's new to me at least! I blame Nouveau Cheap for sharing that L'Oreal had new Color of Hope items, and the fact that my hair dryer broke this morning so I needed to get a new one. Luckily, I didn't run in to anyone with my undried hair! The table top display holds 8 shades, two of each color. They are noted as being Limited Edition shades. 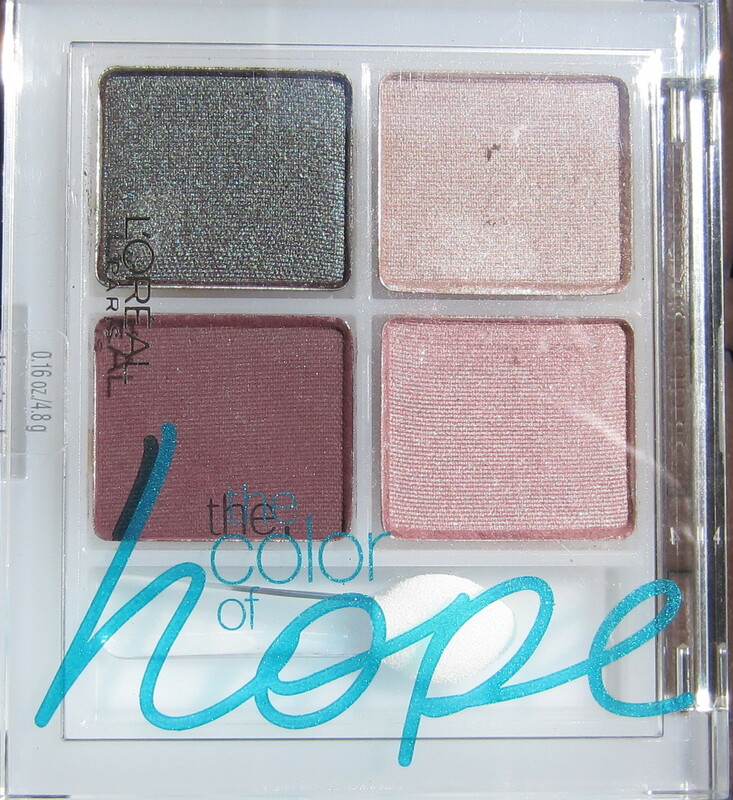 The first four shades (front) from the left looked to be cremes. There's also a pretty pale metallic gold shade in the back row, center. I picked up the remaining three shades. I also picked up a Sinful shade from a small, what looked to be Halloween display. The Sinful shade is called Secret Admirer, but it's not a new shade. Revlon Royal Cloak would've landed with my purchases for the name alone! It's a gorgeous medium purple with iridescent shimmer and larger flaky glitter. There isn't a massive amount of flaky glitter in this one, but it is in there. 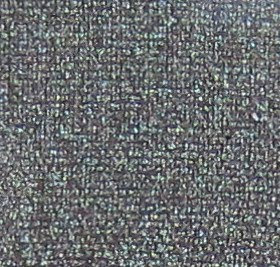 Revlon Midnight Haze--also a cool name--is a steel grey shimmer. I fell in love with this one when upon closer inspection, saw micro glitter in aqua and green. Sinful Secret Admirer is the darkest of grey shimmers with tons of silver micro glitter. Here's a look at the three Revlon's I picked up and the Sinful. 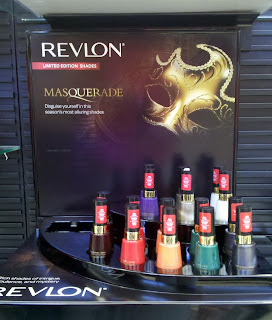 The other shade I selected from Revlon's Masquerade Collection is the white one on the left. It's called Phantom Angel--love the names in this collection! It's a white shimmer that I'd hoped wasn't frosty, and thankfully it is not. I didn't spot any of the nail polishes out from The Color of Hope Collection, but you can view those here on Nouveau Cheap. The Sentimental Splendor Palette is what I really wanted, so I picked that up. Look at that shade in the top left! 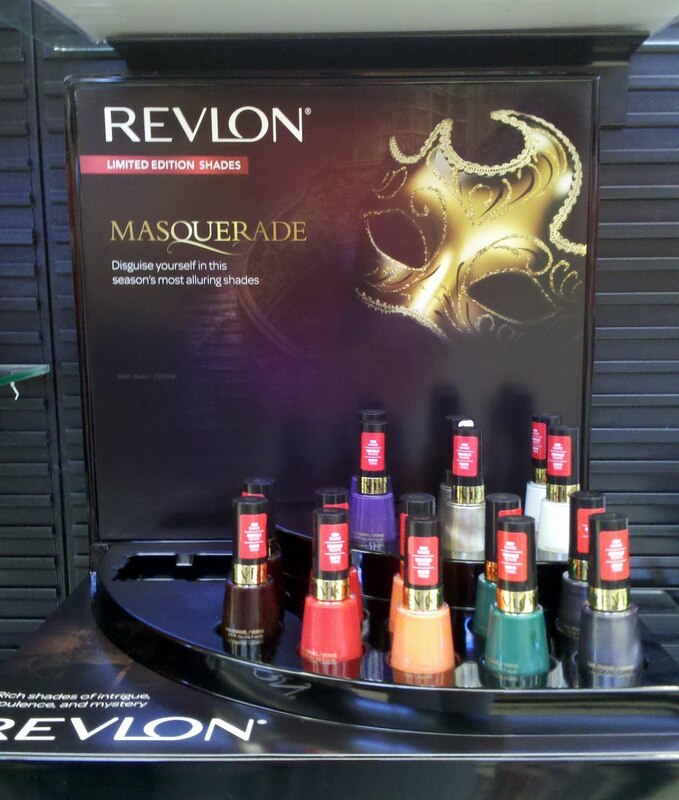 Have you seen Revlon's Masquerade Collection yet? There are so many collections coming out right now, it's hard to keep up. I was hoping to find Maybelline's Fall Collection, but all my Walgreens had was everything from the Runway collection except the nail polish. There are just a couple of shades that I'd like to pick up from that collection, but it'll show up eventually. Lucky you that your drug stores get these collections. I live in nowhere land and it's rare we get but maybe 6 collections of any brand a year. I have not seen a bottle of L'Oreal polish in eons. Wondering what the campaign theme is for? Color of Hope for what? Have to look on their web site and see if it says. @beachgal: The Color of Hope is for Ovarian Cancer. I believe it said that for every $5 of cosmetics bought they would donate a $1 to the cause. About the L'oreal collection, I first read it on Gotham Polish's blog but I HAVE YET see it anywhere! I'm hoping when I move to Minneapolis on the 30th I'll be able to spot it in one of their drugstores. I want Whimsical and Mystery so badly. I'm so upset that I missed getting Blue Marine in the spring. I just love metallics and foils! Also, I am still on the hunt for Carbonite, which I haven't been able to get my hands on. *crosses fingers* Please Minneapolis! Please! 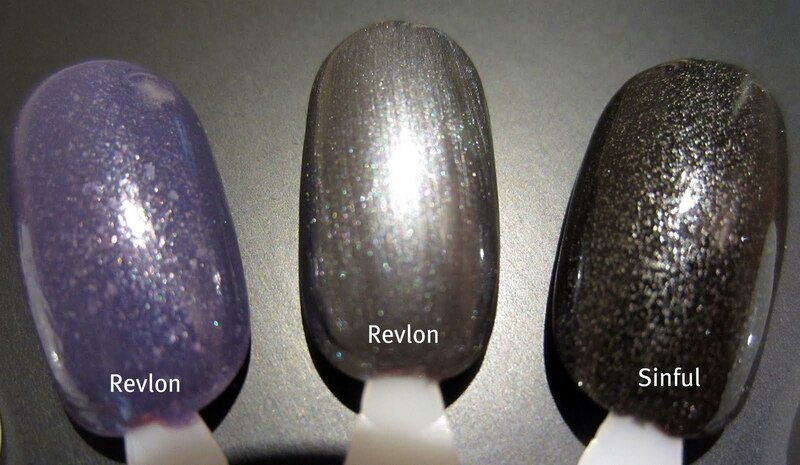 Also, Revlon's Midnight Haze appears to be in the same vein as Sally Hansen's Gunmetal. Do you have the two and do they look similar?? It seems (just from recall) maybe Gunmetal might be a more blue base than Revlon. I haven't seen these yet. All of them are pretty,especially Royal Cloak! I don't think I'll buy anything from this collection. Nothing any different from what I already have. Ooh, that eyeshadow is PRETTY Mary! I'm drooling over it. Secret Admirer is one of my favorite Sinful polishes, I like it so much better than Orly Goth. I think I might need to pick up Royal Cloak! The collection has not come in my place. Looking foward to seeing it. Royal cloak is on my to get list as of ............now! That color is awesome! Great post! I found some other new Revlons(pastel metallics) that I posted about, but have not seen these yet! How sad! Also the Color of Hope nail polishes are amazing! Great application! Thanks for sharing the display picture. It makes it SOOO much easier to look for products! I can't wait to get my hands on the Masquerade collection!